The pricing information in Profiles of Success can serve as a guide when developing your own club’s pricing strategy. Our research expert breaks it down. For more than 30 years, IHRSA’s annual Industry Data Survey (IDS) has gathered key performance indicators (KPIs) among leading health club companies. The resulting report, Profiles of Success, compiles and analyzes key metrics as well as common club practices such as club reinvestment and pricing. Whether your club company is among industry leaders or you’re striving to get there, this must-have reference provides you with insights to measure your club against the best in the business. With the wealth of data available in Profiles of Success, perhaps one of the hidden gems in the publication is a section on pricing, which can serve as a guide when developing your own club’s pricing strategy. Before you can draw insights on club pricing from Profiles, it’s imperative to define your club type. Are you an independent club, part of a chain, fitness-only facility, or multipurpose club? What sets your business apart from your competitors? Based on the overall sample that participated in the Industry Data Survey, clubs reported charging a median of $61 in monthly membership dues and $74 in enrollment/initiation fees. Although the overall median provides a bird’s-eye view of pricing among leading clubs, a more relevant comparison is rendered by club type. Identifying your club type will help you better compare your price point against similar facilities. Multi-purpose clubs charge a median of $75 in monthly dues. Considering the wide range of services and facilities most multi-purpose clubs offer, monthly access is often pricier than the overall median. Along with a monthly dues fee of $75, the typical multi-purpose club also charges an enrollment/initiation fee of $82. If your club has sports facilities such as racquet and aquatics, community-oriented programs such as health education workshops, and the typical group exercise and training programs available at most fitness-only clubs, be sure your membership plans are priced accordingly. Also, most multipurpose clubs are often larger in square footage than other facilities, an important factor to keep in mind as you develop your club’s pricing strategy. For example, sample clubs with an indoor square footage of 60,000 or greater reported charging a median of $96 in monthly dues and $89 in enrollment/initiation fees. 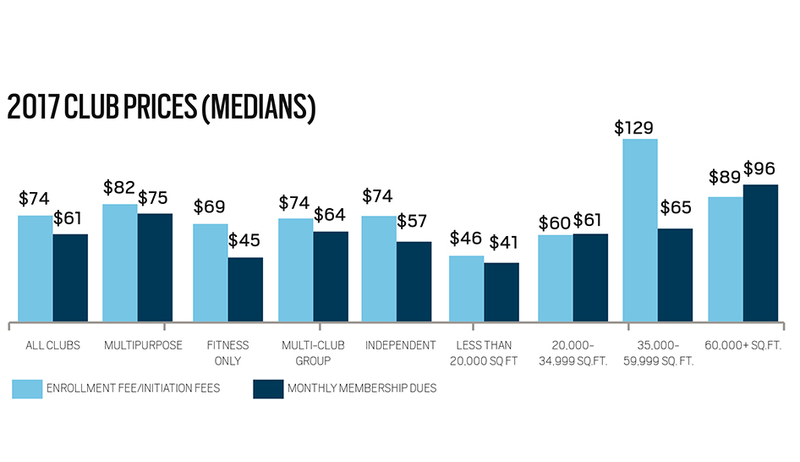 The typical fitness-only club charges $45 in monthly dues. Fitness-only clubs participating in IHRSA’s Industry Data Survey reported charging a median of $45 in monthly dues and $69 in enrollment fees, the lowest among all segments observed in Profiles of Success. 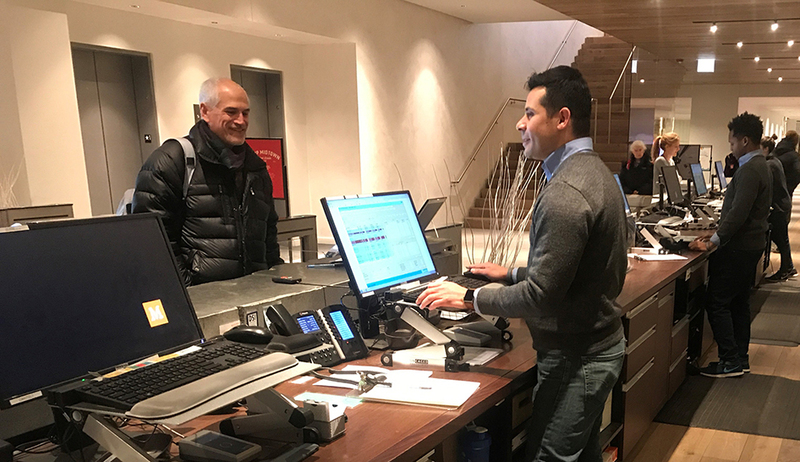 A median of $45 in monthly dues places the typical fitness-only respondent near a mid-market price range, highlighting the success some leading club operators have with adopting a mid-tier price point. Does your fitness-only club offer services and amenities beyond cardio and resistance facilities, such as personal training, group exercise, retail, beverage/juice bar, etc.? If so, you may employ a membership pricing strategy that emphasizes affordability and value at a reasonable cost. Clubs part of a chain charge a median of $64 in monthly dues; independent clubs $57 per month. Clubs part of a chain as well as independent clubs often vary in pricing strategies, highlighting the importance of competitive advantage. In the 2018 IDS, clubs part of a chain reported charging a median of $64 in monthly dues and $74 in enrollment fees. However, the middle range for monthly dues at multi-site clubs varied the most among segments at $45-$112.67 per month, showing the variety of pricing options at facilities part of a multi-club group. Historically, independent clubs that participated in the IDS reported a higher monthly dues fee than clubs part of a chain. However, the most recent IHRSA Profiles of Success shows that independent clubs charged a median of $57 in monthly dues and $74 in enrollment fees, both less than the amounts charged by the typical club part of a chain. This distinction may be attributable to the sample of participating clubs, which can vary from year to year. Nonetheless, increasing competition among clubs has clearly impacted pricing on club dues and fees. Understanding your club’s competitive advantage can help you stand out and justify a pricing strategy differentiated from the pack. What market or niche do you serve best that a nearby club may not? What programs are you best known for? Consider these questions as you develop and revisit your club’s pricing strategy. Conduct your own market research and analysis. IHRSA’s Profiles of Success contains valuable data to compare your club’s pricing strategy against leading businesses similar to your club type. Although it is no substitute for your own market research and analysis, Profiles can help you understand the overarching benchmarks and KPIs of leading clubs, which every club manager strives to run. As you conduct your own competitive analysis, use Profiles of Success to help you better understand club finances and operations at large and what to aim for in order to stand out as a top-tier club business. The 2018 IHRSA Profiles of Success analyzes annual performance of leading health and fitness clubs, including key performance indicators, profit center analysis, and financial statement data. This product is a PDF download. Our research expert explains findings from IHRSA's Fitness Training Report, which analyzes personal training clients across demographics.